TAXABLE VALUE – A tax appraisal is conducted by the local appraisal district. The tax appraisal sets the value at which your property will be taxed and is not necessarily the market value of a property. It may seem counter-intuitive to want a low appraisal, but as far as tax appraisals go, the lower the better. Why would you want a low appraisal? The lower it is, the lower your taxes will be. The tax assessor’s value is certainly something to consider when pricing your property to sell, but it is not the only opinion to consider. The real estate market fluctuates often but the assessed value is only calculated once a year, so is historically a somewhat backward looking value. ROBOT APPRAISALS – Almost every online real estate website can give your “estimated home value” practically instantly with the click of a mouse. Sounds perfect, huh? But…how accurate are they? This type of estimated value is called an Automatic Valuation Model (AVM), or a “robot appraisal,” as I call it. The instantaneous value is created by a set of formulas and algorithms and if you visit different websites, you will get different value projections. Should you list your home according to these online values? Should you make a purchase offer based on the insta-robot appraisal from a random website? The answer is a resounding absolutely NOT! These types of appraisals are the most wildly inaccurate of them all. BANK APPRAISALS – A bank appraisal is not performed by the bank itself, but is performed by a licensed appraiser on behalf of the bank/buyer. The appraiser visits the property to examine the condition, location, and features. Those features are compared against recent sold properties and market trends to create the appraiser’s opinion of value. 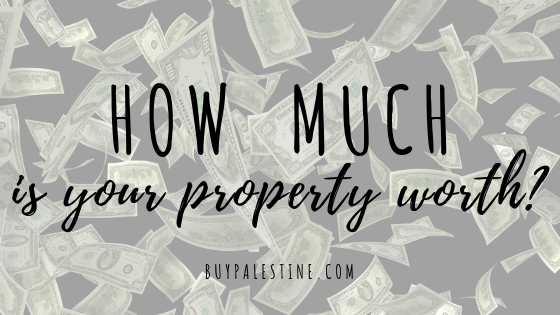 An appraisal will protect the buyer from overpaying for the property (even if the tax value is much lower!). It also protects the bank’s interests by limiting the maximum amount financed to the appraisal amount. A licensed appraiser’s report is typically the most current and accurate of the three valuation systems previously mentioned. At the end of the day, a property is only worth what a buyer is willing to pay for it. The best thing to do when pricing your property is to consider the source of the valuation you are using. There is a lot of money at stake, so my advice is to get professional advice either from your local Realtor or a licensed appraiser. It all seems confusing, but there is a sweet spot in there somewhere to get to the best valuation of all—the sold price.